The Department for Education has introduced a statutory duty for schools to promote British Values from September 2014, and to ensure they are actively promoted and adhered to in schools. The Derby High School is committed to serving its diverse community. It recognises the multi-cultural, multi-faith and ever-changing nature of the United Kingdom. It also understands the vital role it has in ensuring that groups or individuals within the school are not subjected to intimidation or radicalisation by those wishing to unduly, or illegally, influence them. The Derby High School is dedicated to preparing students for their adult life beyond the curriculum and ensuring that it promotes and reinforces British values to all its students. The Derby High School uses strategies within the national curriculum and beyond ensure positive outcomes for students. 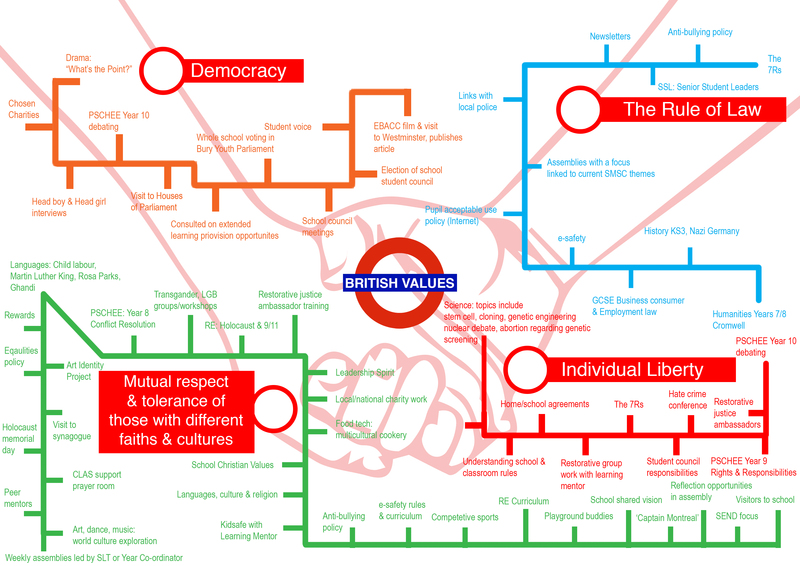 The examples that follow are intended to give you just a taste of the many ways in which we seek to instill British Values. All people and institutions are subject to and accountable to law that is fairly applied and enforced. • The increasing liberty afforded to students as they move up through the years. • Opportunities for freedom of speech and expression through mediums such as the school newsletter, pupil voice etc. • Charity Christmas hampers for the needy in the local community.